Primark Dresses first appeared on Chictopia's streetstyle gallery in Summer 2008 seen on Edinburgh blogger DigitalLove of j-ad0rrre.blogspot.co.uk. She styled her Primark floral dress with a blue Gap denim jacket, black Topshop leggings, and brown Faith synthetic bag. Since then, Primark Dresses have grown in popularity as bloggers from London, United Kingdom, and London have discovered them. Primark Dresses are generally seen in casual, chic, and romantic style. Popular types of Primark Dresses are polka dot, bodycon, floral print, lace, and floral. Blogger's favorite colors are black, blue, white, and navy. There are currently 1393 streetstyle photos of bloggers wearing Primark Dresses. 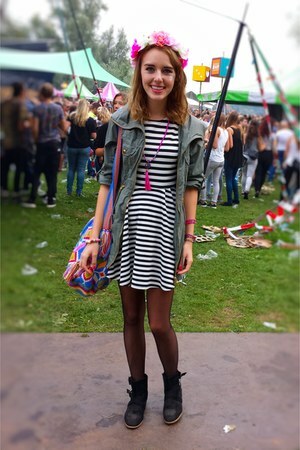 Most recently, blogger BriarRose of thebriarroseblog.com wore her Primark floral dress with a Dr Martens shoes and crown and glory headband hair accessory.